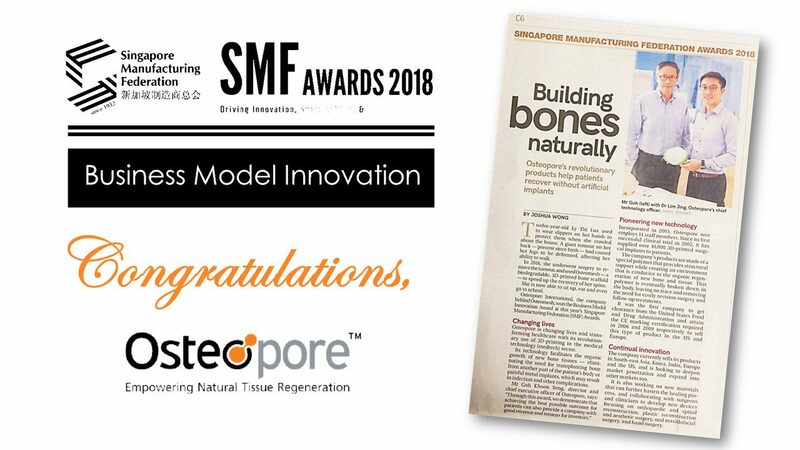 Osteopore was honoured with an accolade for achieving excellence in innovative thinking and implementation in business model change. They are the winner of the Singapore Manufacturing Federation (SMF) Award for Business Model Innovation. The objective of this Award is also to inspire the business community to pursue transformational growth through business model innovation. Catch Osteopore at Industrial Transformation ASIA PACIFIC 2018 Trade Exhibition from 16-18 October 2018 at Singapore EXPO. They are located at Booth F06, NAMIC Start-Up Pavilion. Dr Lim Jing, Chief Technology Officer of Osteopore is also speaking at NAMIC Global AM Summit on 18 October in the Biomedical Track.